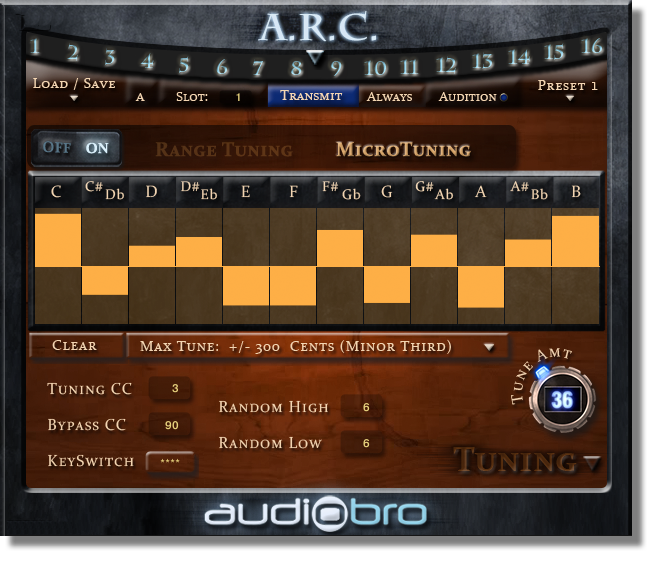 The Tuning page has 2 modes (Range Tuning and Micro Tuning) and gives you the control to de-tune any note or group of notes by as much as a minor 3rd (300 cents) as well as develop micro-tonal scales (seen above). This was mainly designed to give each divisi section a little variety (tuning-wise) by drawing a curve in the tuning table and adding some randomization to the tuning each time a note is played. It can’t be emphasized enough how much this feature can change the character of a string section’s sound. The Micro Tuning table (shown above) lets you create micro-tonal scales that repeat across every octave. You can get very creative by doing drastic tuning and using the CC3 (tuning amount) to create aleatoric sounds (string effects) even with regular patches. The pattern you draw here is repeated exactly the same way on every octave, thereby creating a repeated “micro-tonal scale”. As with everything in the ARC, these changes can be applied to one, many, or all patches in a single step… making it easy and fun to experiment! !